LAUGFS Supermarkets, a pioneer in the retailing industry, recently announced the launch of its latest outlet in Kesbewa, in keeping with the company’s rapid expansion strategy. This outlet marked the 34th addition to the LAUGFS Supermarkets’ retail chain, and is the largest outlet under the flagship brand LAUGFS Super. Located at No. 107, Horana Road, Kesbewa, Piliyandala, the outlet was ceremoniously unveiled by LAUGFS Chairman W.K.H. Wegapitiya, and LAUGFS Group Managing Director Thilak De Silva. Customers will have the opportunity to purchase a myriad of products, ranging from daily essentials, fresh fruits and vegetables, frozen food items and household durables at the new outlet. LAUGFS’ own Crimson Bakery provides customers with freshly-baked delicacies, while the Medz Pharmacy, utility bill payment and a range of facilities ensures that customers meet their lifestyle needs under one roof. An ample parking space and a spacious shopping area provide greater convenience for customers, while a modern and vibrant ambience enhances the overall shopping experience. 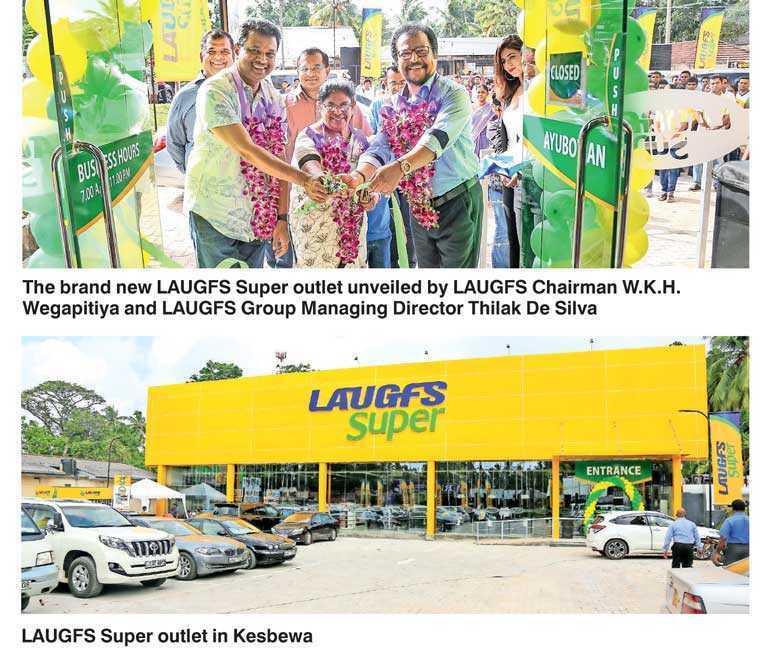 LAUGFS Supermarkets recently rebranded its outlets with a two-tier approach under the brands LAUGFS Super and LAUGFS SuperMart. Expanding into urban and suburban areas, LAUGFS Super effectively caters to a diverse spectrum of shopper needs, delivering an unmatched experience in the supermarket retail industry. LAUGFS SuperMart is a smaller convenience store offering daily essentials to customers, to ensure they receive a shopping experience to suit their lifestyle. LAUGFS Supermarkets is a subsidiary of LAUGFS Holdings, catering to thousands of customers daily. Pioneering the 24-hour supermarket retail concept in Sri Lanka, LAUGFS Supermarkets also introduced the concept of establishing convenience stores alongside fuel retailing outlets in the country.